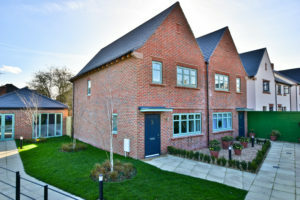 Hertfordshire homebuyers looking to secure a brand-new home should visit Inland Homes’ Farrier’s Wood development in Garston, on Saturday 27th of April where they will be able to don a hard hat and tour the homes for themselves. Although still under construction, a variety of properties ranging from one bedroom apartments to three and four bedroom houses will be available to view so potential purchasers can visualise the lifestyle of this growing new community. Available through Help To Buy, purchasers at Farriers Wood can secure a new home with just a 5% deposit, meaning with starting prices of £280,000, deposits start from £14,000. Not just for first time buyers, Help To Buy can be used by a range of purchasers on homes up to £600,000. Situated in the on the edge of the Hertfordshire Green Belt in the village of Garston, Farrier’s Wood comprises a collection of elegantly designed homes including one and two-bedroom apartments and two, three and four-bedroom houses. Benefiting from an excellent location, just a short drive from the thriving town of Watford, each home at Farrier’s Wood is completed to Inland Homes’ exceptional high standard with a fantastic specification to match. Ideal for families, first-time buyers and professionals, Farrier’s Wood combines comfort with kerb appeal. To secure a place at the Hard Hat event, visitors will need to pre-register with the Farrier’s Wood sales team on 01923 624095 or email farrierswood@inlandplc.com.